While children are affected by many of the same foot problems as adults, there are certain conditions that pertain specifically to children, many of which develop during the first few years of life. These conditions may be present at birth as a result of genetic factors or birth trauma, or may be acquired during the early years of childhood. It is important to seek proper treatment for pediatric foot conditions to ensure that your child’s feet will continue to grow and develop normally with no ongoing problems. Clubfoot involves the foot turning inward to the side, resembling the head of a golf club. This condition can affect one or both feet and is usually present at birth, although the cause is unknown. Also known as pigeon toes, in-toeing involves walking with the feet turned inward. This condition usually occurs between 8 and 15 months, when the child begins to walk, and usually affects both legs. 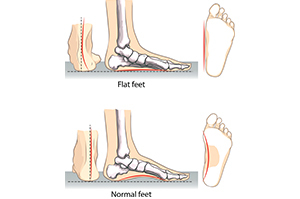 Most children are born with flat feet, with arches developing as the feet strengthen. In some cases, this condition may continue into adolescence and cause pain in the feet, ankles or legs. Pediatric heel pain is often caused by a disorder called calcaneal apophysitis, and is most common in children between the ages of 8 and 14 years old. Unlike adult heel pain that tends to improve as the day goes on, pediatric heel pain is often worse with walking and activity. There are many treatment options available for pediatric foot problems. The best treatment for your child will depend on his or her individual condition, but may include stretching exercises, casting, orthotics and surgery. Many children can successfully overcome their foot problems and may play sports and continue to grow unaffected. Parents should bring their child to see a doctor at the first sign of foot problems in order to prevent the condition from causing permanent damage. To learn more about Pediatric Foot Problems & Podiatric Services, please contact us at 410-749-0121410-749-0121 today or click here to schedule an appointment.